This month marked the much-anticipated reopening of Quad Cinema, a New York cinephile institution. The embarrassment of riches in their inaugural slate of programming features a retrospective of Lina Wertmüller, the Italian director best known for her 70s films like Swept Away and Seven Beauties. Wertmüller’s films deal in political and sexual provocation, shot through with a dry, often difficult-to-read sense of humor. For many years, due to the mysterious ebb and flow of cinematic tastes, Wertmüller’s work has been considered a bit out of fashion, but the director is currently enjoying a resurgence of appreciation and press thanks to the Quad. As an Italian filmmaker of the 70s, it’s no surprise that her films feature some memorable outfits, but Wertmüller’s work, with its political consciousness and astringent humor, doesn’t revel in fashion. Rather, the most dynamic costumes are used as a mode of difference. In both The Seduction of Mimi (1972; it screens on Thursday) and Love and Anarchy (1973; available on Kino Lorber DVD/Blu-Ray and streaming platforms), fashionable moments stand out amidst political turmoil. The Seduction of Mimi is a tonally strange film, which moves from the olive drab politics of labor relations to a colorfully attired affair. The avatar of style here is Fiore (Mariangela Melato), a knitter whom the title character (Giancarlo Giannini) meets when he sees her selling sweaters on the street. Their fashion contrasts are immediately apparent—Mimi is not the dapper, suited figure often found in Italian cinema, and he wears a dark, baggy coat while Fiore drapes herself in a colorful shawl. Soon enough, Fiore and Mimi begin an affair, and Mimi starts wearing sweaters knit by his lover, in a sign of their new closeness. Admittedly, the sweaters look a bit awkward on him. Mimi isn’t a character who cares much about fashion. The illicit couple, who eventually start a secret family together, start dressing alike in Fiore’s colorful wares. The sweaters, with their bold chunks of color, recall the Coogi sweaters popular in the 1980s—Wertmuller wasn’t only trailblazing in the field of being a female filmmaker, but in style forecasting knitwear. Costume is used as a source of unlikely humor throughout The Seduction of Mimi. At one point, Fiore and Mimi end up on the run from the mob, with their child in tow. The family dress up in a parody of incognito fashion, all black clothes and dark glasses, even, amusingly, for their son. Love and Anarchy, made a year later and also starring Melato and Giannani as a politically active pair, features a very different style of costuming. The film takes place in a brothel pre-World War II, and is filled with decadent silk underthings. Though a period piece, the outfits of Love and Anarchy mirror the look of many fashion shoots of the time. 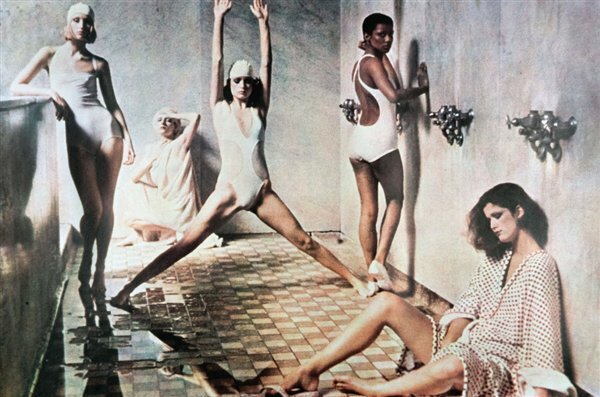 The louche decadence that wouldn’t be out of place in a 70s Deborah Turbeville Vogue photo shoot is well-served by Wertmüller’s camera. In one sequence, she offers languorous close-ups on a variety of the prostitutes, each woman dressed the same but slightly different. The white silk romper is something of a uniform, then customized with robes, shawls, necklaces, rolled socks, and deceptively prim mary janes. Salome, a rebellious prostitute played by Melato, stands apart. She wears all black, and poses like a femme fatale. She doesn’t have the softness of the other women, which makes her an ideal character in Wertmuller’s dark, politically complex world. In both of these films, the presence of dynamic dress in worlds that may otherwise be relentlessly bleak is disarming and clever. There’s a personal component to the costumes in Wertmuller’s 70s oeuvre as well—the costumes for these two films were designed by Enrico Job, the director’s husband and frequent collaborator. The Seduction of Mimi and Love and Anarchy, with their irreverent takes on knitwear and boudoir chic, show just how fruitful this collaboration was.